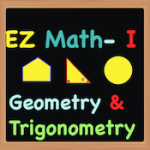 This is the first part of our EZ Math iPad app series for Middle school students from Grades 5 to 8. It covers various topics on Geometry and Trigonometry. All content is OFFLINE and hence no internet is needed to access the main quiz. The app provides copious content for students to practice and hone their math skills. The topics are aligned to the US Common CORE standards. Please note that the app does NOT teach any particular topic. Rather it is designed to help students to practice whatever they have learned in their classroom. There is a short and quick review for each topic quiz but essentially the app assumes that the student is already aware of the topic and ready to check their skills. It has a fairly simple and intuitive quiz format and has a huge and oft-updated database of questions. The questions are random, so every time you take the quiz on a topic, the chances are you will get some new questions each time. The progress report scores are captured and can be mailed to parents or teachers. A cool scratchpad, within the app, for rough work eliminates the need of a pen and paper.